In order to assess and improve fitness, it is important to have valid and reliable a performance fitness test (PFT) that can be feasibly repeated and recorded by test administers. It is important for PFT’s to take into account specificity regarding different positions and their different physical demands. For the soccer referee crew, that means PFT’s need to assess the requisite fitness demands of soccer head referees (referees) and assistant referees (assistants) discussed in Part 1 – aerobic fitness, repeated sprint ability (RSA), and change of direction (COD). In this blog, I will review the aerobic fitness portion of the current soccer referee PFT for each position and discuss how they can be improved to better test fitness and determine their match readiness using variations of the Yo-yo Intermittent Recovery Test (YYIRT). I will also provide practical resources for the referee crew to efficiently train their fitness using high-intensity interval training (HIIT). Currently, Federation Internationale de Football Association (FIFA), the Union of European Football Associations, and other renowned soccer referee organizations, such as the United States Soccer Federation, utilize the same PFT – the FIFA Fitness Test – comprised of the Repeated Sprint Ability and the Interval Test (and the Change of Direction Ability for Assistant Referees). Generally performed at the end of the PFT, the Interval Test is arguably the most important as it tests the most crucial physical requirement of both referees and assistants – aerobic fitness. Designed to be aerobically taxing with intermittent bouts of high and low-intensity runs and adjustable to accommodate some of the positional differences between referees and assistants (see Figure 1 for test description), the Interval Test has many major flaws in its practical application and ability to predict match readiness and performance. First, it requires a track (or a full-size soccer field), which is not readily available for all referees and organization. Secondly, the test audio must be audible to runners across the entire track/field, which necessitates either loudspeakers or one or more test administrators yelling when to start and stop. Also, these administrators should be at each start/stop point in order to determine whether every runner made it or not. Having participated in a multitude of these tests with my local referee organizations, I rarely see enough test administrators and often witness runners cheat this test, making this test almost useless. Referees must complete 20 x 150m run / 50m walk intervals. This equates to 10 laps of a 400m athletics track. A lap consists of two 150 meter runs with two 50 meter recovery walks. Each run must be accomplished within 45 seconds. The walk interval shall be 45 seconds. Referees must start from a standing position. They must not start before the whistle. 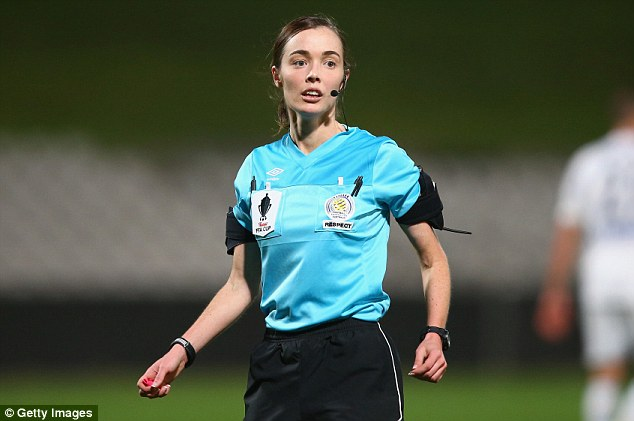 On the whistle, referees are allowed to start running. 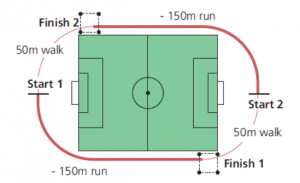 At the end of each run, each referee must enter the ‘walking area’ before the whistle (45 seconds). The walking area is marked out with a line 1.5m before and 1.5m behind the 150m line. Most importantly, according to Castagna et al, the test itself is “does not relate to match performance” and should be revised to be more “task-specific” in order to measure aerobic fitness with repeated high-intensity bouts and COD, such as the (YYIRT)(1). It is important to distinguish between the two YYIRT levels and note that Level 1 is the most appropriate version for referees since it best measures the capacity to perform intermittent exercise using the aerobic system (2). Having been validated for soccer referees, the YYIRT is already being used in some organizations to distinguish referees of higher/lower score with the necessary fitness for hierarchal levels of competition (3). For more information on the YYIRT and how it is and can be used, check out Greg Gustin’s article. The high-intensity running, the sum of high-speed running and sprinting, and the total distance covered during match play in male professional football players. The total high-intensity running distance, high-intensity running distance during the final 15 minutes of each half, and moderately correlated with total distance covered during match-play in female professional football players. The high-intensity running, sprinting and total distance covered by youth football players. The 20m multistage shuttle run/beep test in youth football players. An incremental treadmill test (Bruce protocol) in youth football players. The repeated sprint ability in youth football players. The University of Montreal Track Test. Since referees have been shown to best resemble midfielders, it may be possible to generalize these correlations with this position. Another valuable aspect of the YYIRT is its significant correlation to maximal oxygen usage (VO2Max), an important aspect of aerobic fitness, which is calculable (2). Given a large amount of normative data with soccer players, this will allow the referee crew to see their fitness more objectively and see how they compare to the level of players they officiate (Figure B). Very similar to the Interval Test for referees, the test for assistants is the same total length (4000m) except the intervals are shorter and more frequent (see Figure 2 for test description). The pace is dictated by the audio file and reference times are set in accordance with the assistant referee’s category. Assistant referees must start from a standing position. They must not start before the whistle.On the whistle, assistant referees are allowed to start running. 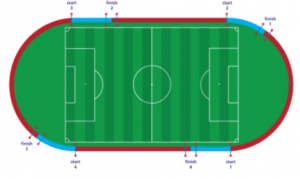 At the end of each run, each assistant referee must enter the ‘walking area’ before the whistle. The walking area is marked out with a line 1.5m before and 1.5m behind the 75m line. If an assistant referee fails to place a foot inside the walking area on time, they should receive a clear warning from the test leader. If an assistant referee fails to place a foot inside the walking area on time for a second occasion, they should be stopped by the test leader and informed that they have failed the test. 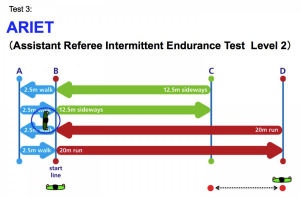 With the same practical and scientific drawbacks as the FIFA Interval Test for referees, this test has the same solution to better measure fitness of assistant and predict their match readiness – the Assistant Referee Intermittent Endurance Test (ARIET) (see Figure C). While FIFA and other organizations are beginning to utilize the YYIRT and ARIET for testing the fitness of soccer referees, they are only optional tests that must be done in addition to the FIFA Interval Test (3). As this test still remains the official ‘gold-standard’ of measuring aerobic fitness, despite its many glaring flaws, the soccer referee crew must avoid the temptation of – 1) solely rehearsing the Interval Test as just a means of passing the PFT, and 2) only using long-slow distance (LSD) runs (or other cardiovascular training modalities). Training in these manners is a sure-fire means of inefficiently training and risking not being match ready, but intelligently using HIIT will improve the performance capacity of referee crews and better prepare them for match play. I often see and hear referee crew members boasting that the only time they train their fitness (outside of refereeing matches) is 2-3 weeks prior to a PFT and all they do is rehearse the FIFA Interval Test. Yes, this is mostly done out of laziness, but if most of them end up passing the PFT, who’s to blame them? The problem with this approach is, the Interval Test is an invalid match readiness predictor (1); therefore, it is an insufficient way of preparing referees for a match. It is important for officials to be familiar with the current Interval Test in order to pass the PFT, but it is vastly more important for them to be match ready. With sufficient HIIT, referee crews can develop a level of fitness to be match ready and pass the PFT. It is also common to hear referee crew members remark, “I ran a few miles per week,” in order to pass the pre-season PFT or to ‘get in-shape’ before the season. While LSD runs are a useful tool, they require more time than HIIT and may not be as necessary after a baseline fitness has been established, especially if an individual has officiated soccer for numerous season. It is crucial to remember the intermittent nature of soccer and the requirement of referee crews to perform multiple high-intensity bouts of running during matches. If an individual does not train this ability, then is unlikely they will perform at the level necessary in a match. Simply, HIIT improves the performance capacity of referee crews during matches (5), prepares them for the high-intense runs, and is more time-efficient than only performing LSD runs. How referees and assistants can incorporate HIIT into their overall training plan is where the art of program design comes into play. These individuals will need to take into account their current training loads, number of matches, overall running volume, along with several other fitness-related (and non-fitness-related) factors. There are numerous resources available specific to referee crews that provide accessible and practical training options, such as the US Soccer Referee Department (6), that take advantage of HIIT on soccer fields or treadmills. It is important to remember that many sub-elite referees and assistants tend to officiate more often and more total games than their elite counterparts, who tend to officiate only one match per week. Therefore, sub-elite officials may have a higher running volume per week than elite officials. This is certainly why elite referee crews absolutely must train aerobic fitness outside of matches, and why the program from US Soccer is designed for elite referees. This program may need to be accommodated for sub-elite referees to further improve aerobic fitness during the season and off-season. However, fitness is not the only quality that is measured; RSA and COD are also vital for referees and assistants to test and improve. In the next blog, I will discuss the other portions of the FIFA Fitness Test and how referee crews can train to improve RSA and COD to improve match performance.